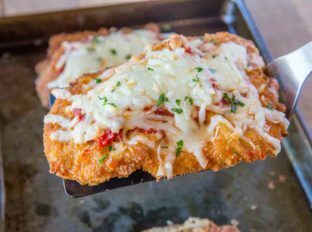 The Best Chicken Parmesan is a classic Italian favorite, breaded and baked with an easy marinara sauce, Parmesan and mozzarella cheese in just 30 minutes! 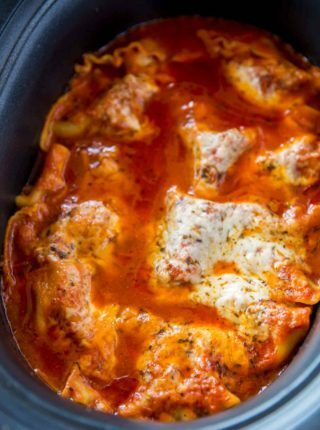 Classic Italian Recipes are an easy weeknight option in our household and we love Ultimate Meat Lasagna made with Easy Marinara Sauce, Easy Carbonara Pasta and these Amazing Stuffed Shells (they’re so quick you have to try them!). 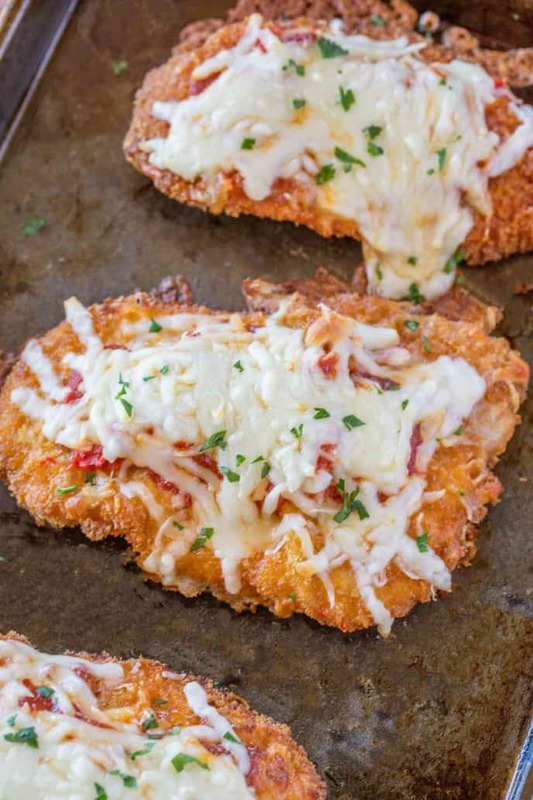 The Best EVER Crispy breaded chicken breasts topped with homemade marinara and melted mozzarella and provolone cheeses. Serve it up with pasta, Garlic Bread and a Copycat Olive Garden Salad for the best classic Italian restaurant favorite. Depending on how fancy of an Italian restaurant you get chicken parmesan from it may be called chicken parmesan or chicken parmigiana. They are the same dish, just read the second one with a super Italian accent. Why do they call it chicken parmesan (parmigiana)? It’s called chicken parmesan (or Baked Chicken Parmesan) as a throwback to eggplant parmesan where slices of eggplant were coated in bread crumbs and fried before being served with slices of parmesan cheese on top. The most important part of the dish is the coating process. We set up a standard breading state with shallow dishes and we mix the bread crumbs with grated parmesan cheese so you get extra parm flavor in the breading too. Can you Meal Prep this Chicken Parmesan Recipe? 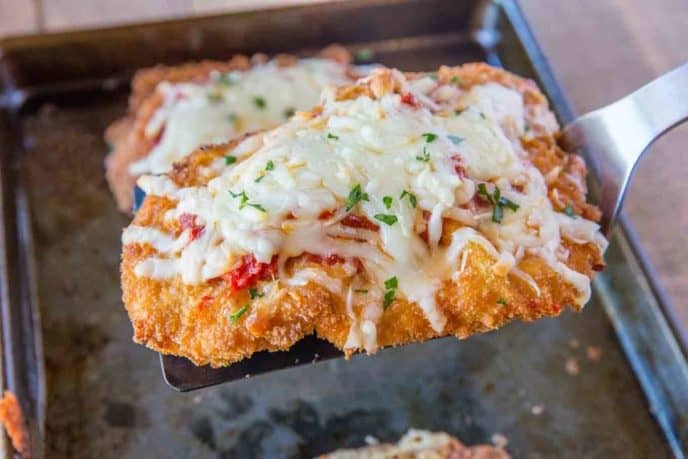 This is a great recipe that will taste like your favorite restaurant but you can even meal prep it making it all the way through the breading process then freezing the chicken breasts then baking them off at a later date. Make sure to allow for extra baking time because the chicken will be frozen and preheat the oven to 25 degrees lower to allow for the breading to cook without burning. 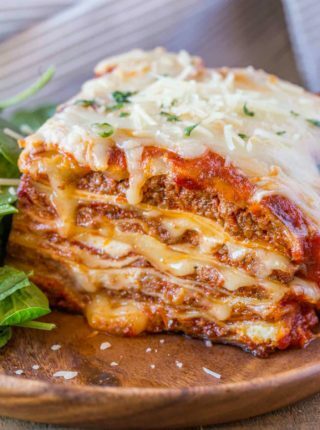 In it’s modern form it is a popular Italian-American dish served with melted mozzarella and normally just garnished with parmesan cheese. 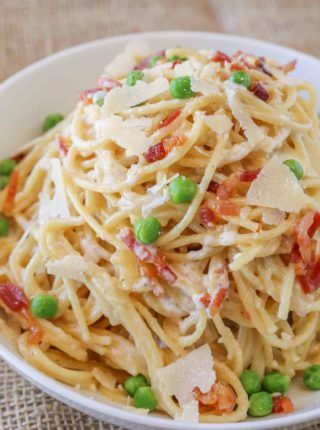 This recipe calls for parmesan cheese to be added to the breading for even more flavor. topped with pepperoni after that dinner and I even started making the marinara with the kids as a fun project we could do together. If you’re looking for a more outside the box chicken parm option there’s also my favorite dark horse recipe: Noodle free Chicken Parmesan Casserole with a super unexpected crispy topping you can serve up with fettuccine or my personal favorite, tortellini. I’ve served it to ALL my friends and they all love it and can’t believe the topping. Or you can make a super fun cheeseburger take on Chicken Parm and make my Chicken Parmesan Sloppy Joes! They’re so easy and delicious to make you’ll make them all the time. This recipe is cooked partially in the skillet before being cooked the rest of the way in the oven to help the breadcrumbs get crispy and browned while the chicken cutlets stay moist. You can of course finish cooking the chicken through in the skillet then top with the sauce and cheese, cover with a lid and allow the cheese to melt quickly and serve immediately but the time in the oven allows us time to cook pasta and it also gives the sauce a bit of time to dry out in the oven so it isn’t so soggy. You can serve chicken parmesan with spaghetti in its classic presentation, steamed vegetables or spiralized zucchini noodles for a lighter option. Chicken parmesan is also regularly served on hoagies as a hot sub sandwich. Fresh parsley, fresh basil and freshly shaved parmesan or pecorino cheese are my go-to topping options. Chicken Parmesan is served with a classic marinara sauce which is added to the top of the chicken cutlet and baked with shredded cheese on top. You can also serve it over other pasta recipes like this Cheesecake Factory Louisiana Chicken Pasta or Cheesecake Factory Chicken Bellagio. Why don’t you add more sauce to the chicken? The sauce is meant for flavor but not to drown the chicken out. It also makes a spot on the chicken where the breading softens. The remaining part of the chicken not covered in sauce is able to remain crispy. Preheat an oven to 375 degrees and spray a baking sheet with cooking spray. Put the chicken breasts between two pieces of saran wrap or parchment paper and using a rolling pin or flat kitchen mallet flatten it to 1/2 inch thickness then season them with salt and pepper. In three shallow bowls add the flour to one, eggs to one (and beat until combined) and the panko and Parmesan cheese to the other (and mix). Dredge the chicken in the flour, then the egg and finally press it into the panko mixture. Add the olive oil and butter to a cast iron skillet on medium high heat and cook the chicken for 3-4 minutes on each side until golden brown (it'll be raw inside still). Add the chicken to a baking sheet, add the marinara sauce on top and finally top with the shredded mozzarella and cook for 18-20 minutes. Your recipes make me look like a rockstar in the kitchen! Lord have mercy this chicken parm was absolutely delicious!! So easy to follow the directions and didn’t take too long to make. I accidentally used Italian Panko breadcrumbs which I didn’t know existed, and it was superb!! Thank you for your wonderful recipes and for all the work you put into sharing them!! You are so sweet to say! I’m glad you’re enjoying the recipes. Made this tonight. The recipe was easy to follow and turned out great. Thanks for sharing. 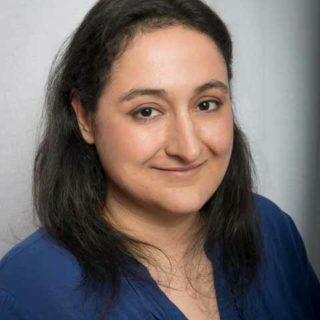 You’re welcome, Torinana! Thanks for the 5 stars. This recipe was outstanding! Every guest raved about it! Yay!! Thanks for making my Monday. This was soooo delicious! We both could not talk… just kept eating. Thanks for the 5 stars, Jen. So glad you enjoyed it! You’ll want to use boneless skinless chicken breasts for this recipe. You’ll want pieces that are thicker, maybe 3/4 inch thick. 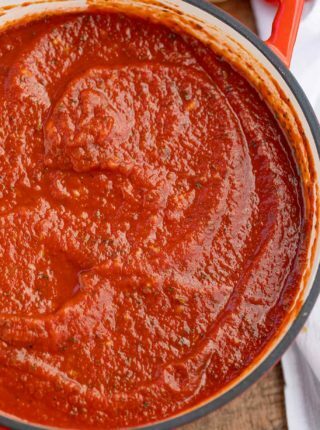 Sabrina, I made the marinara adding extra minced garlic and basil; it was perfect. I’m looking forward to making chicken parmesan. Thank you for your website; I absolutely enjoy all the recipes! Do you think you could prepare the chicken and keep it warm in a crock pot till ready to serve? You’ll just want to make sure it doesn’t stay in there too long and dry out. Enjoy! Hey I’m making this dish for my family and I’m just wondering how long I need to bake the chicken for?? You’ll want to brown the chicken on both sides and then it goes in the oven for 18-20 minutes. Enjoy! wonderful easy recipe! My family’s bellys very satisfied! Will make again! This looks delicious! I’m making it tonight…would i be able to prepare it all except for the baking step and just keep it in the fridge until time to bake it or would it mess it up to put it in the fridge after cooking it in the cast iron? Unfortunately I wouldn’t suggest that due to bacteria with half cooked chicken. I would just make it all at once. Enjoy! How sweet of you to say, Shannon! Thank you! This is the first time I can really say I was surprised at how AMAZING this tasted. Usually the recipes are just ok and good. This was to die for! Even my husband, who seems to find fault with everything, loved it and didn’t complain. Yummmmmmm. Yay!! You just made my day!! Hi Sabrina-I would like to try your recipe tomorrow night for about 6-7 people. I see this recipe serves 4. Would you recommend I just double the ingredients? Please get back to me when you can. Thank you. There is a slider tool on each recipe card for you to increase or decrease the serving size and it will adjust your ingredients to match. Just hover over the serving size and it’ll show up. Hope this helps! does it have to be iron skillet ? I prefer a cast iron skillet because it gets a nicer crust on the chicken but it’s not necessary. You can use any fying pan you have on hand. Found this very easy to make and was very happy with the results! Tasted great will do this again! I used pepper jack slice on top. Added a little heat. Wonderful! Juicy chicken and very easy to make! CHicken parm. turned out easy and delicious. So glad you enjoyed it Pat! My husband said that this is the best chicken he has ever had! Love it!! Thank you so much for coming back to let me know how much he enjoyed it! Can i use chicken cutlets? no offense, but nothing even closely similar to this recipe exists in Italy. it will be tasty, no doubt, but no one single restourant (or mom) would prepare a dish like the one in the photo. 100% american stuff. don’t confuse. Have been looking for a good Chicken Dish. Thanks Will give you my thoughts. We made this for our Valentine’s Day dinner tonight. My fella told me it was as good as the Chicken Parmigiana we order at our favorite Café Amore! Thanks Sabrina! Yay!! I’m so glad you both enjoyed it! I love easy and delicious chicken recipes! This chicken is exactly how I love it: crispy and cheesy! Definitely want to try your recipe soon! Wow! Looks so heavenly! My family would love this chicken recipe! Brahh I’m making this for a new lady interest. How did it turn out? This meal looks so cheesy! 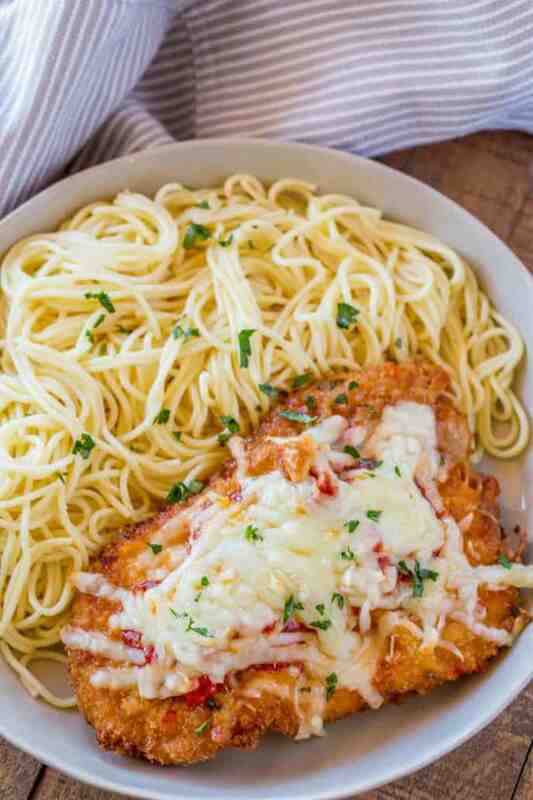 We seriously love chicken parmesan here, and I love your idea of adding parmesan to the breading! Thank you! You can never go wrong with adding cheese!